Globally, ovarian cancer is the seventh most common cancer in women and the eighth most common cause of cancer death. In India, a steady increase has been observed in the incidence of the ovarian cancer in several registries and has emerged as the third/fourth most common cancers among females, but the leading cause of death from any gynecological malignancy. It is even three times more lethal than breast cancer. This high mortality with ovarian cancer lies with the fact that, most of the time, they present at advanced stage as the disease has no specific symptoms. According to the studies, if these are detected at earlier stage when they are localized to the ovary, >90% of such patients would have a survival longer than 5 years. Hence, an early detection, differentiation, and determination of any adnexal mass are of immense importance. The early diagnosis of cancer could be made possible if neoangiogenesis is regarded as a neoplastic marker for a tumor. This is based on “Folkman's theory of neovascularization,” according to which tumor cells elaborate tumor angiogenesis factor that promotes neovascularization, and therefore, by knowing the blood flow characteristics, one can predict whether the tumor is benign or malignant. Consequently, this knowledge of tumor blood circulation with the help of Color Doppler studies in addition to conventional grayscale ultrasonography (USG) has provided new dimensions in characterization and differentiation of ovarian tumors and early diagnosis of malignancy.,,,, In such scenario, the present study has been done to explore the efficacy of color Doppler study in addition to grayscale USG in differentiation of such masses. The present prospective study, conducted at a tertiary care institute of Eastern India over a period of 2 years, was carried out on patients who came for the diagnostic evaluation of a clinically suspected or palpable adnexal mass with symptoms suggestive of ovarian tumor such as pain, irregular cycles, and fullness of abdomen or incidentally detected ovarian mass. Before enrolment, informed consent was taken from each patient. Under a fixed protocol, each patient had undergone a detailed history and clinical examination followed by USG, color Doppler, and USG-guided fine-needle aspiration cytology (FNAC). Histopathological diagnosis obtained following surgery considered as gold standard. The results of USG, color Doppler, and USG-guided FNAC were compared with the histopathological diagnosis and with each other. Grayscale USG and color Doppler sonography were carried out with a real-time ultrasound and Doppler scanner unit (LOGIQ 500 Version 4.10, GE medical system). Transabdominal sonography (TAS) of the pelvis and upper abdomen was done with a 3.5-MHz curved transducer in the supine position, and transvaginal examination with a wideband 5–9 MHz intracavitary transducer in dorsal position with an empty bladder. Evaluation was limited to TAS of the pelvis in three virginal patients and 15 other patients who refused transvaginal sonography. 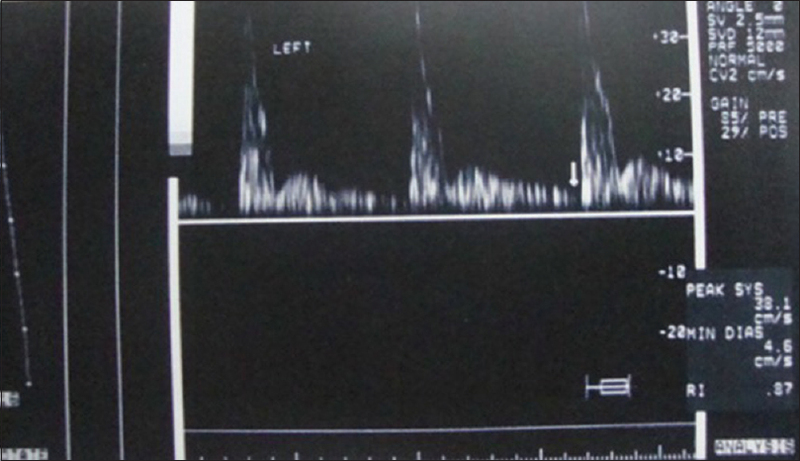 Color Doppler parameters were standardized, and for all the patients, the same presets were used for acquisition. Color Doppler study was done at high-sensitivity settings and lowest pulse repetition frequency possible, without aliasing. The vessels detected on color Doppler studies were evaluated further with spectral Doppler imaging. When present, internal vessels were evaluated in preference to peripheral vessels. Pulsatility index (PI) and resistance index (RI) were calculated, and the lowest values were recorded when a reproducible series of waveforms was obtained. The masses were classified as suggestive of malignancy when the lowest calculated PI was <1.0 or lowest RI was <0.4, as described by Kurjak et al. These indices later correlated with histopathological reports. 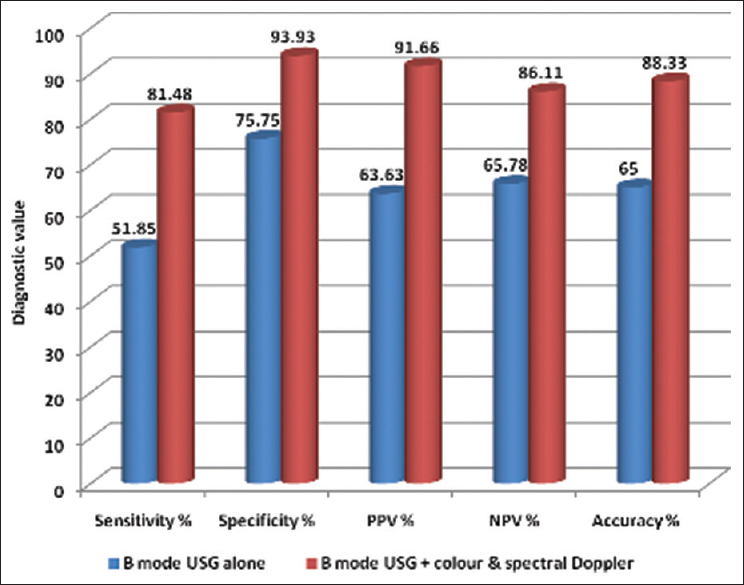 The sensitivity, specificity, positive predictive value (PPV), and negative predictive value (NPV) of grayscale USG alone and with color Doppler were calculated, and the efficacy of color Doppler study was adjudged using Chi-square test. All patients with adnexal masses of an extraovarian origin, determined during any stage of diagnosis or having unilocular anechoic ovarian cyst that resolved or reduced substantially in follow-up USG, were excluded from the study. Apart from these, any patients who did not complete the protocol of the study or lost to follow-up were not considered for the study. Of 98 patients who presented with adnexal masses, 60 patients were found to be eligible for the study based on the selection criteria. Thirteen patients who had masses of nonovarian origin, 10 patients who did not undergo surgery and histopathological examination, four patients who died in between the study, four patients who did not give consent for the study, and seven patients who lost to follow-up, were excluded from the study. Of the selected 60 patients, 33 (55%) patients were found to have benign disease after final (histopathological) diagnosis and the remaining 27 (45%) patients had malignant disease [Figure 1]. Abdominal swelling (63%) and pain (60%) were the most common presenting symptoms. The maximum number of cases was found in the age group of 40–60 years; majority of patients of ovarian tumor were multipara; The rate of malignancy in ovarian cases was higher in nullipara (66%), and it gradually decreased as the parity increased. 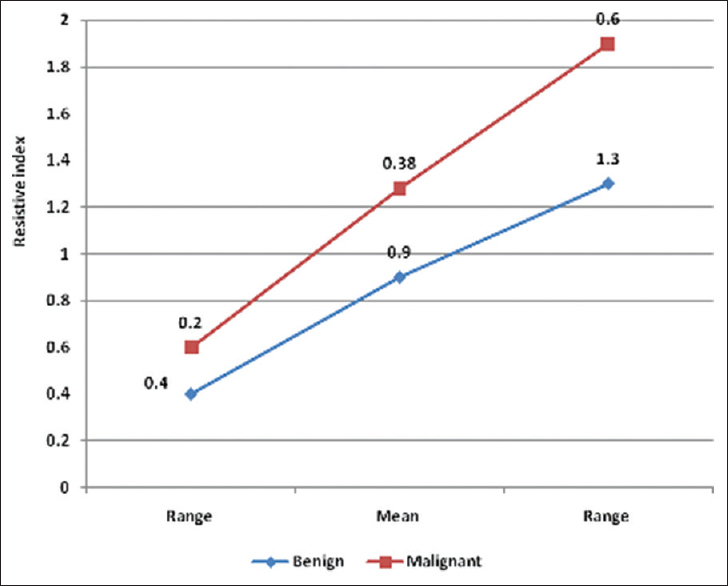 Majority (62.96%) of malignant cases were premenopausal whereas benign cases were almost equally distributed in either group. On USG, most of the benign masses were predominantly cystic in consistency (90%), with well-defined margins (84.84%) and thin septations (53.57%). In comparison, most malignant masses were predominantly solid in consistency (76%), with ill-defined margins (66.66%), thick septations (63.63%) [Figure 2], and papillary projections (90.90%). Ascites was present in half of the patients of ovarian tumor, and most of the patients with ascites (70%) had malignancy. On color Doppler study, 92.59% of malignant lesions had neovascularization in contrast to 42.24% of benign lesions [Table 1]. Central vascularity was seen in 76.47% of malignant solid ovarian tumors in contrast to 25% of benign solid ovarian tumors [Figure 3] and [Figure 4]. Eighty-eight percent of malignant tumors had mean systolic velocity >15 cm/s in contrast to only 14% of benign tumors [Table 2]. Nearly 92.59% of malignant tumors had PI <1 while only 15.15% of benign tumors had PI <1. On the other hand, 88.88% of malignant tumors had PI <0.8 in comparison to only 6.06% of benign tumors. All those malignant tumors showing neovascularity had PI <1.00 while most of the benign tumors showing neovascularity had PI >1.00 [Figure 5] and [Table 3]. About 29.62% of malignant tumors and none of the benign tumors had RI <0.4 while 92.59% of malignant tumors had RI <0.6 in contrast to only 9.09% of benign tumors [Figure 6]. Most of the benign vascular tumors had RI >0.6 [Figure 7] while none of them had RI <0.4. In comparison, most of the malignant vascular tumors had an RI <0.6 [Table 4]. Nearly 88% of malignant ovarian tumors had absence of diastolic notch while only 14% of benign of tumors were showing the absence of diastolic notch. Sensitivity, specificity, PPV, and NPV of grayscale ultrasound in detecting malignancy in ovarian masses in the current study were calculated to be 51.85%, 75.75%, 63.63%, and 65.78%, respectively. By combining grayscale and color flow finding, the current study was able to differentiate malignant tumors from benign tumors with a sensitivity of 81.48%, specificity of 93.93%, PPV of 91%, and NPV of 86.11%, and this diagnostic gain was statistically significant (P < 0.05 for each diagnostic index) [Figure 8]. Due to wide array of types and origin, anatomical location in female pelvis and vicinity of structures of different systems, periodic physiological changes within, atypical symptoms, and insidious onset, early diagnosis and characterization of ovarian masses is often challenging. USG is considered the primary imaging modality for the confirmation of the ovarian origin of mass and characterization of nature of mass as benign or malignant. Sonographic evaluation of ovarian masses is based on size, external contour, internal consistency, and secondary signs of malignancy as ascites and peritoneal implants, and it correlates morphologic images with macroscopic pathologic features of tumor such as nonfatty solid tissue, thick septations, and papillary projections. Unfortunately, there is no specific ultrasound criteria for benign or a malignant tumor. 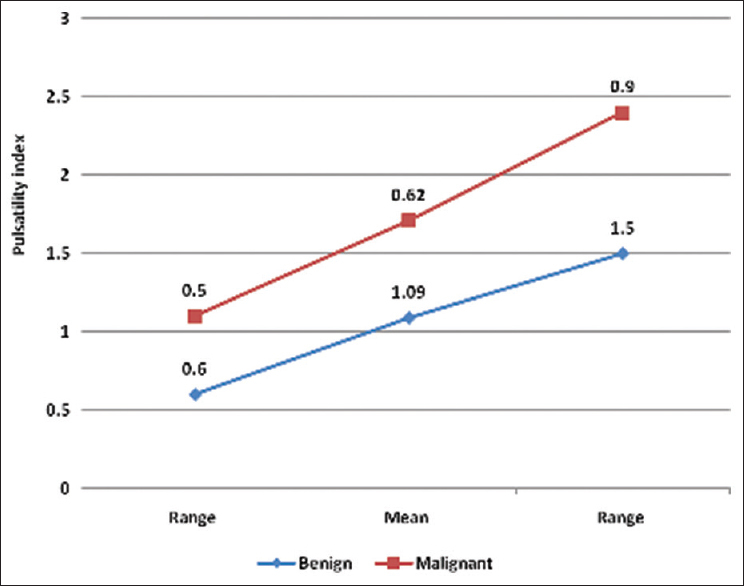 Several scoring systems based on the morphologic characteristics have been proposed; however, they concluded that a completely reliable differentiation of benign malignant masses cannot be obtained by morphologic criteria alone. The sensitivity of morphologic analysis with US in predicting malignancy in ovarian tumors has been shown to be 85%–97%, whereas its specificity ranges from 56% to 95% and, therefore, had the limited usefulness of sensitivity in individual patients because of low specificity and PPV. Our study illustrates the special role of color Doppler in labeling the solid tumor of ovary as benign, if it did not show any significant vascularity. The NPV of absence of vascularity in the present study was 90.46%. At the same time, vascularity was present in 92.59% of malignant lesions in contrast to 42.24% of benign lesions, but the PPV of mere presence of vascularity for malignancy was only 64.1%. These findings were correlated well with the study done by Stein et al., which suggested that internal color flow cannot be used as a predictor of malignancy (PPV, 49%), but the absence of color flow suggested benignity (NPV, 94%). In Doppler studies, the site of tumor vascularity does not affect the diagnosis in cystic neoplasm, as the tumor vascularity is encountered almost equally in the wall and septae; however, if the tumor is solid, benign nodules usually have predominant peripheral vascularity whereas malignant nodules have predominant central vascularity [Figure 3] and [Figure 4]., In the present study, also, central vascularity was encountered in 76.47% whereas peripheral vascularity was observed in 23.53% of solid tumors. Therefore, malignant masses have higher peak systolic velocity (PSV) as compared to benign masses. Khanna et al. reported a PSV of >20 cm/s in 51.85% and PSV between 10 and 20 cm/s in 40.14% of malignant tumors. In the present study, 88% of malignant tumors had mean systolic velocity >15 cm/s in contrast to only 14% of benign tumors, which is very similar to what reported by Fleischer et al. Further, with the use of spectral analysis indices such as PI and RI, a better differentiation of ovarian neoplasm can be achieved. Low impedance to blood flow with high velocity is suggestive of malignancy, whereas moderate-to-high impedance to blood flow is correlated to benign tumors., Resistive indices <0.4–0.8,, and PIs <1.0 are generally considered to be suspicious for malignancy.,,, Kawai et al. found that color Doppler is 100% sensitive in diagnosing malignant tumors if RI was <0.4. Still, they found that about 2% of benign tumors had low impedance pattern, i.e., RI <1. Similarly, in a large series of 628 patients, Kurjak et al. found that all malignant tumors had RI <0.4. As all malignant neoplasms offered lower resistance to blood flow due to the presence of aberrant tumor vessels, in the same study, Kurjak found and proposed a PI of <1 (PI <1) for all malignant ovarian tumors, and it was supported by Valentin et al. and Fleischer et al. in later studies.,, However, to optimize the study in terms of sensitivity and specificity, Carter et al. used cutoff criteria of PI <0.8 and RI <0.6. In the present study, 92.59% (25) of malignant tumors had PI <1 in contrast to 15.15% (5) benign tumors [Figure 5]. On the other hand, 29.62% of malignant tumors and none of the benign tumors showed RI <0.4 [Figure 6]. When the data of the present study were extrapolated using the criteria of PI <0.8 and RI <0.6 as proposed by Carter et al., 88.89% (24) of malignant tumors had PI <0.8 in contrast to only 6.06% (2) of benign tumors. Similarly, 92.59% (25) of malignant tumors showed RI <0.6 in contrast to only 9.09% (3) of benign tumors. Thus, using the cutoff criteria of PI <1 and RI <0.4 for the malignant ovarian tumors, color Doppler study becomes highly specific and less sensitive with RI <0.4 while it becomes more sensitive and less specific with PI <1. Using the same criteria, Kurjak and Predanić achieved better results in terms of sensitivity and specificity, which was mainly attributable to the study group that mainly comprised postmenopausal women. Shah et al. in their study found that their data were slightly more specific and less sensitive with RI <0.4 and more sensitive and less specific with PI <1. Hence, to optimize sensitivity and specificity, they proposed PI <1 and RI <0.6, which should be taken as cutoff. This has been reflected in the present study also. By combining grayscale and color Doppler finding, the present study was able to distinguish between benign and malignant tumors with a sensitivity of 81.48%, specificity of 93.93%, PPV of 91%, and NPV of 86.11%. Carter et al. (1994) also reported the similar results (sensitivity of 83%, specificity of 95%, PPV of 91%, and NPV of 90%) as in the current study. Though the present study was unable to reproduce the extraordinary results (sensitivity of 97.3% and specifi city of 100%) published by Kurjak and Predanić; however it showed a signifi cant increase in the sensitivity, specifi city, PPV, and NPV when color Doppler is used in conjunction with grayscale USG as compared to grayscale USG alone in establishing the preoperative diagnosis of malignancy or benignity in ovarian masses, and it is in harmony with other studies, and well supported by the large multicenteric European study. Hence, color Doppler should always be used in combination with grayscale USG as the first diagnostic modality of choice for all the patients with ovarian masses. World Cancer Research Fund/American Institute for Cancer Research. Continuous Update Project Report. Food, Nutrition, Physical Activity, and the Prevention of Ovarian Cancer; 2014. Available from: http://www.dietandcancerreport.org/cup/cup_resources.php. [Last accessed on 2018 Mar 02]. Murthy NS, Shalini S, Suman G, Pruthvish S, Mathew A. Changing trends in incidence of ovarian cancer – The Indian scenario. Asian Pac J Cancer Prev 2009;10:1025-30. Lu KH, Patterson AP, Wang L, Marquez RT, Atkinson EN, Baggerly KA, et al. Selection of potential markers for epithelial ovarian cancer with gene expression arrays and recursive descent partition analysis. Clin Cancer Res 2004;10:3291-300. Ribatti D. Judah Folkman, a pioneer in the study of angiogenesis. Angiogenesis 2008;11:3-10. Taori KB, Mitra KR, Ghonge NP, Ghonge SN. Doppler determinants of ovarian malignancy: Experience with 60 patients. Indian J Radiol Imaging 2002;12:245-9. Fleischer AC. Sonographic depiction of tumor vascularity and flow: From in vivo models to clinical applications. J Ultrasound Med 2000;19:55-61. Barua A, Abramowicz JS, Bahr JM, Bitterman P, Dirks A, Holub KA, et al. Detection of ovarian tumors in chicken by sonography: A step toward early diagnosis in humans? J Ultrasound Med 2007;26:909-19. Shy K, Dubinsky T. Is color Doppler ultrasound useful in diagnosing ovarian cancer? Clin Obstet Gynecol 1999;42:902-15. Kurjak A, Shalan H, Kupesic S, Predanic M, Zalud I, Breyer B, et al. 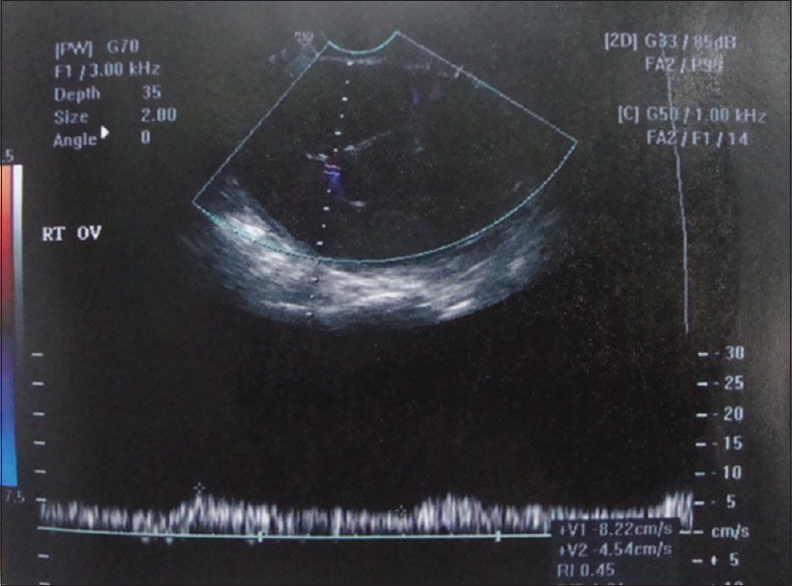 Transvaginal color Doppler sonography in the assessment of pelvic tumor vascularity. Ultrasound Obstet Gynecol 1993;3:137-54. Jeong YY, Outwater EK, Kang HK. Imaging evaluation of ovarian masses. Radiographics 2000;20:1445-70. Salem S, Wilson SR. Gynecologic ultrasound. In: Rumack CM, Wilson SR, Charboneau JW, Johnson AM, editors. Diagnostic Ultrasound. 3rd ed., Vol. 1. St. Louis, Missouri: Mosby Inc.; 2005. p. 527-87. Stein SM, Laifer-Narin S, Johnson MB, Roman LD, Muderspach LI, Tyszka JM, et al. Differentiation of benign and malignant adnexal masses: Relative value of gray-scale, color Doppler, and spectral Doppler sonography. AJR Am J Roentgenol 1995;164:381-6. Desai D, Desai VA, Verma RN, Shrivastava A. Role of gray scale and color Doppler in differentiating benign from malignant ovarian masses. J Midlife Health 2010;1:23-5. Carter J, Saltzman A, Hartenbach E, Fowler J, Carson L, Twiggs LB, et al. 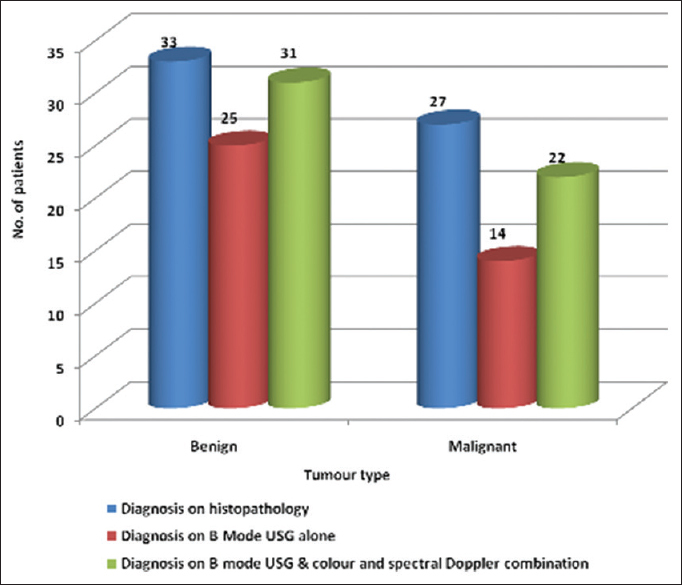 Flow characteristics in benign and malignant gynecologic tumors using transvaginal color flow Doppler. Obstet Gynecol 1994;83:125-30. Shah D, Shah S, Parikh J, Bhatt CJ, Vaishnav K, Bala DV, et al. Doppler ultrasound: A good and reliable predictor of ovarian malignancy. J Obstet Gynaecol India 2013;63:186-9. Valentin L, Sladkevicius P, Marsàl K. Limited contribution of Doppler velocimetry to the differential diagnosis of extrauterine pelvic tumors. Obstet Gynecol 1994;83:425-33. Kurjak A, Schulman H, Sosic A, Zalud I, Shalan H. Transvaginal ultrasound, color flow, and Doppler waveform of the postmenopausal adnexal mass. Obstet Gynecol 1992;80:917-21. Fleischer AC, Cullinan JA, Jones HW 3rd, Peery CV, Bluth RF, Kepple DM, et al. 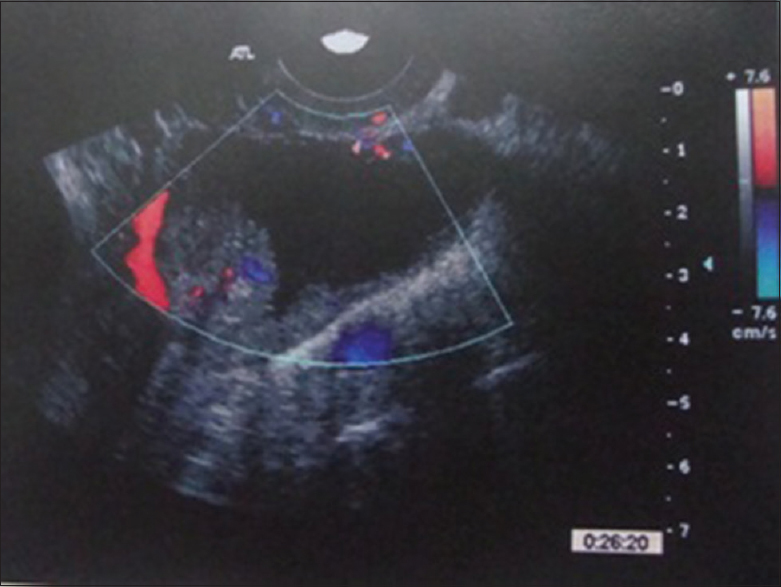 Serial assessment of adnexal masses with transvaginal color Doppler sonography. Ultrasound Med Biol 1995;21:435-41. Khanna A, Garg S, Shukla RC. Colour Doppler study for differentiation of various adenxal masses. Singapore J Obstet Gynaecol 2002;33:35-9. Kawai M, Kano T, Kikkawa F, Maeda O, Oguchi H, Tomoda Y, et al. 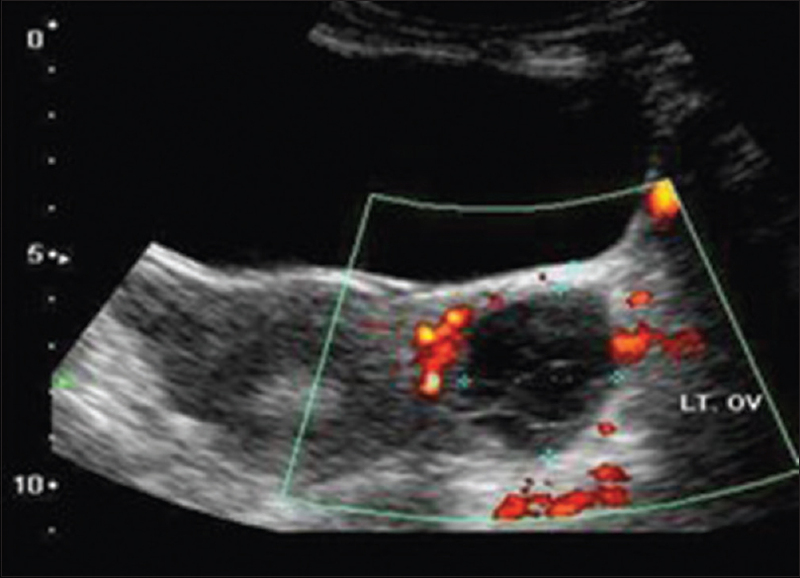 Transvaginal Doppler ultrasound with color flow imaging in the diagnosis of ovarian cancer. Obstet Gynecol 1992;79:163-7. Kurjak A, Predanić M. New scoring system for prediction of ovarian malignancy based on transvaginal color Doppler sonography. J Ultrasound Med 1992;11:631-8. Buy JN, Ghossain MA, Hugol D, Hassen K, Sciot C, Truc JB, et al. Characterization of adnexal masses: Combination of color Doppler and conventional sonography compared with spectral Doppler analysis alone and conventional sonography alone. AJR Am J Roentgenol 1996;166:385-93. Guerriero S, Alcazar JL, Ajossa S, Lai MP, Errasti T, Mallarini G, et al. Comparison of conventional color Doppler imaging and power Doppler imaging for the diagnosis of ovarian cancer: Results of a European study. Gynecol Oncol 2001;83:299-304.